This picture, taken in 1961, shows the construction of the I-95 bridge over the Harlem River which would connect the Cross Bronx Expressway to the George Washington Bridge approach. Notice that the Washington Heights apartment towers that would later straddle the highway had not yet been built. The old Washington Bridge is just north of the construction site. Taken in 1954, this is a view of 167th Street where it crosses Ogden Avenue and rises eastward past Nelson Avenue. According to my father, the triangular, wooden building at the bottom of the picture was originally built before Lincoln was president. This 1956 photo is a view of University Heights facing northeast. At the bottom right is Ogden Avenue. The white brick cluster of buildings just left of center were the Noonan Plaza Apartments. At the far left you can see part of P.S. 11, and I believe that the white building at the horizon in the middle was Lebanon Hospital on Mt. Eden Avenue and the Grand Concourse. Looking southeast from our apartment in Highbridge Houses in 1956, you are looking at the back of the Crest Theater on Ogden Avenue. On the other side of Ogden was a vacant lot, and to the right of the theater was a commercial building. Eight years later, in 1964, you can see the construction of a new A&P Supermarket on Ogden Avenue where the vacant lot had been. The commercial building to the right of the Crest is in ruins. In the far background at the top right, you can see the twin towers of the Concourse Plaza Hotel on 161st Street and the Grand Concourse. Here is a progression of pictures, beginning in 1954 and ending in 1964, that shows the construction of the Major Deegan Expressway. 1954: Early construction used barges and the New York Central railroad (which would later become the Hudson Line of Metro North) to transport materials for the highway. The rail equipment at the far right were Madison Passenger and Baggage cars. Construction office trailers stand where the actual roadway would later be built. In the background is Highbridge, still open for foot traffic, spanning the Harlem River and the Harlem River Drive, and terminating at Highbridge Tower, which rose above Highbridge Pool. 1955: Most of the construction offices have been removed and the road bed is wider, with piles of stones still to be removed before paving could begin. 1962: Completed and heavily used by this time, the Deegan quickly became an indispensible route from the Bronx to "the country." North of the Bronx it became the New York Thruway, and endless Bronxites could now easily find their way to summer escapes in bungelow colonies in the Catskills. 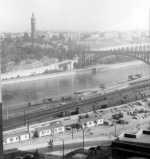 1963: To the right of Highbridge Tower, you can see that construction of the Washington Heights towers, being built directly above the I-95 approach to the George Washington Bridge, was about halfway completed. At the bottom is the access road from Sedgwick Avenue into the University Heights apartments complex. 1964: The Washington Heights towers are completed, and they provide a sharp contrast to the gothic architecture of the Highbridge Tower. Below, the New York Central right-of-way has been narrowed to only two tracks.